Cool mountain nights retard ripening and encourage sugar production, making for drop-dead late-bloomer peaches and nectarines. There's a farm up in the mountains in Placerville where they grow drupes like what I sweated under in Virginia. The nectar in those nectarines! Makes me a honey bee in those honey beans! I hopped on my buzzbuzz little nymph-green one-speed and raced home after a sixty-hour work week with a sackful of bruisy peeling white nectarines, of the sort that attract fruit flies like me and won't sell but couldn't possibly taste better 'less my quivering hand plucked them from the tree itself. I peeled them, sliced them, mashed them up, tossed them with honey, pectin and a scattering of raspberries for color, and made myself a little nectar for the winter. Jam! The POP of a sealing jar thrums some fat, long chord in me, and gives me sudden chicken-keeping laundry-hanging urges. While my Back Forty may be far off in the misty (not foggy) future, jam, at least is well-suited to cramped urban confines. A few pounds of fruit will give you enough sweetness to fill half-a-dozen jars, which don't take up freezer space and look as pretty as can be on your pantry shelf. When it comes to nutrition, I do not look among my canned goods for healthy staples. Rather, jam is a marvelous summer-reminiscent garnish for buttered toast, thumbprint cookies, and cheese. And that winey fig jam I made with the moldy calmyrnas and missions, all speckled with crunchy seeds and rather too thick? Ready-made filling for pastry-scrap turnovers. Bring 5 half-pint jam jars to a boil in enough water to cover them. In another pot, bring their lids and rings to a boil, too. Turn off the heat and let everything sit in its sterile water. Halve, pit, peel, slice, and half-heartedly mash 5 cups white nectarines. Toss with a quarter cup of lemon juice and the recommended amount of calcium water that comes with the low-sugar pectin, like Pomona's. Bring to a boil and stir in 1/2 cup honey mixed with the pectin powder. Return to a boil and turn off heat. Pull jars from their hot water and fill them to 1/4 inch of the rim. Dip a clean cloth in the hot water and wipe the rim of the jar to remove any spattered jam or other schmutz, place a lid on the jar rim, and screw on the ring. Cap all the jars and place them in their hot water. Bring them to a boil, turn down the heat to maintain a gentle bubble, and boil 5 minutes. Remove the jars from the hot water and let cool overnight. You should hear the "pop!" of the jars sealing as they cool. When properly sealed, the lids will be sucked-in and not pop in and out when you push on the center. 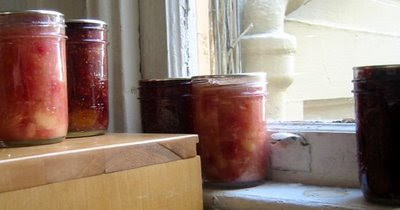 The acidity and sweetness of jam make it fairly risk-free as far as canning projects are concerned. Great post, Rosanna. I've been cooking up a storm with nectarines. Made jam, too. What a luscious fruit.